Happy Thanksgiving to all of our friends, family and neighbors! We hope it is a joyful / reflective time for everyone. We wanted to share two recent pieces from the Register Star, and ask for your continued attention and assistance in protecting our community. ​And once again, a very happy Thanksgiving to you and yours! Broadcast live from the WGXC Hudson Studio. Hosted by Ellen Thurston and Jake "the Intern" Ebel. Click below to hear the 31 minute broadcast. 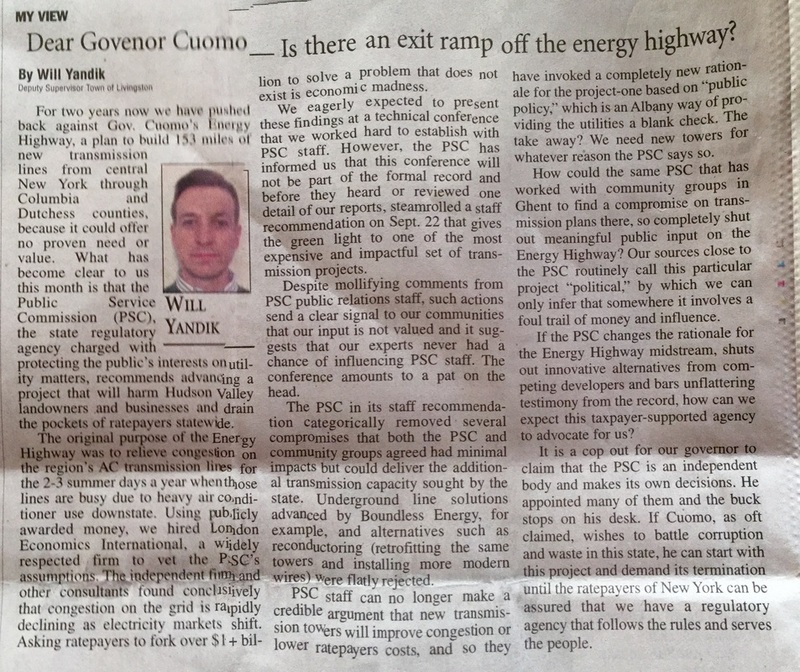 HUDSON VALLEY—The Hudson Valley Smart Energy Coalition (HVSEC) on July 6 submitted to the New York State Public Service Commission (PSC) a series of reports by expert consultants. 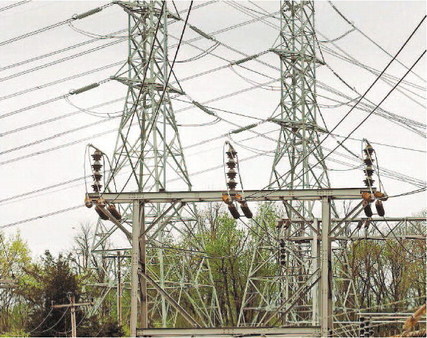 These reports indicate potential major environmental and visual impacts from a current proposal for high-voltage power lines in the Hudson Valley. Research shows some of the proposed projects would threaten the farms and orchards in the heart of the valley’s agricultural region as well as the most-visited natural, cultural and historic sites, including the Roosevelt National Historic Site, where Franklin Roosevelt lived from boyhood through his presidency. The lines proposed under the state’s Energy Highway initiative could reach a height of 120 feet and cut through 25 communities in seven Hudson Valley counties, impacting businesses and regional assets that are the foundation of the region’s economy. The expert reports will serve as the basis of HVSEC presentations in a PSC Technical Conference on Monday, July 20, to discuss environmental, visual and other impacts of the proposed transmission line projects. The HVSEC also has recently been informed by the PSC that its Department of Public Service staff will require more time to analyze need for the proposed high-voltage power lines, so the part of the Technical Conference that addresses need will be postponed until a future date. HVSEC engaged Dr. Richard Smardon, professor emeritus at the SUNY College of Environmental Science and Forestry in Syracuse, to evaluate potential visual impacts from the transmission line projects. Dr. Smardon found that there was potential for significantly increased visual impacts in the Hudson Valley from some of the project proposals. Agricultural areas in Columbia County are particularly vulnerable to any increase in height or number of transmission towers, due to the significant distance over which lines can be seen on the agricultural landscape. Farms are a major part of the local economy in Columbia County. Agriculture and tourism in Columbia County are responsible for more than 1,400 jobs, and $115 million in spending annually. In addition, a number of designated Scenic Areas of Statewide Significance would be traversed by the proposed power lines, which could be visible from the Olana State Historic Site and the Omega Institute for Holistic Studies, both of which are facilities attracting tens of thousands of visitors per year—and contributing strongly to the local economy—in part due to the scenic beauty of their natural surroundings. One proposed project would create a new utility corridor directly adjacent to the FDR Home and Library and through the Roosevelt Farm Lane property and Val-Kill. These National Historic Sites are key destinations of the regional tourism economy in Dutchess County that brings in $475 million in spending yearly and is linked to more than 8,400 jobs. New transmission lines towering nearly 100 feet over the bucolic Roosevelt historic sites would detract from the beauty and integrity of these places. The Farm Lane—historically part of the Roosevelt estate and frequented by FDR during his lifetime—was sold by descendants of the president after his death. When Scenic Hudson preserved the land in 2007 and transferred it to the National Park Service, then-U.S. Secretary of the Interior Dirk Kempthorne termed it “the most important expansion of the Roosevelt National Historic Site that will ever happen.” The construction of new transmission lines through this key link between two National Historic Sites would be a major blow to the integrity of the properties and regional heritage-tourism economy. HVSEC engaged CC Environment & Planning of Batavia, N.Y., to evaluate potential environmental impacts from the transmission line projects under consideration by the PSC. The firm found that all of the proposed projects would likely result in some permanent environmental impacts to wetlands, water resources, and/or sensitive habitat areas within the Hudson Valley. Projects that propose to use a new transmission right-of-way had high potential for significant impacts, and generally projects that consist entirely of reconductoring would have comparatively less impact. Numerous state-designated Significant Coastal Habitats, Significant Natural Communities and New York State Department of Environmental Conservation classified wetlands could be compromised by one or more of the proposals. Two of the proposals involve entirely new transmission rights-of-way that would impact the state-recognized Illinois Mountain Biologically Important Area in Ulster County. In addition to Hudson Valley and other downstate utility customers paying 90 percent of the projects’ costs—which could exceed $1 billion—as well as 80 percent of any cost overruns, Hudson Valley residents also could lose one of the regional economy’s most important resources—the unique scenic and environmental qualities that attract visitors, companies and skilled workers. Important environmental, scenic and agricultural lands are the cornerstone of a sustainable Hudson Valley economy. By maintaining scenic working landscapes, rural heritage and quality of life, preserving farmland also helps drive economic growth. A study by The Trust for Public Land notes that executives looking to relocate or start firms rank quality of life—including an abundance of parks and open space—higher than housing, cost of living and good schools. Further, conserved farms safeguard wildlife habitat and environmentally sensitive areas, including local aquifers and drinking-water supplies. HVSEC also has engaged experts to evaluate whether the proposed transmission lines are needed at all. The PSC has postponed the part of the technical conference that would focus on this issue, so its staff can evaluate new power generation capacity expected to come on line, further reducing the rationale for the transmission solutions. The HVSEC is prepared to present its case on this issue when the PSC is ready to proceed. Power lines tower over the Con Edison sub station in Pleasant Valley. State regulatory officials did local residents and businesses a grave disservice by approving such a steep rate increase for Central Hudson Gas & Electric Corp. Delivery rates on both electricity and natural gas are going up, and the state Public Service Commission should have done much more to mitigate what the utility has been proposing. This disappointing turn of events demonstrates, once again, there is a dire need for a true, independent consumer protection board in the rate-proposal process. The public must have a much stronger voice in these complicated, highstakes matters. State Assemblyman Kevin Cahill, D-Kingston, has advocated for such an approach. He and many others support establishing a state Office of the Utility Consumer Advocate, among other changes. Other organizations, including the AARP and the local Citizens for Local Power, also have argued for an independent advocate. Yes, the PSC accepts comments from the public and is supposedly charged with protecting the public’s interests, as is a unit of the Department of State. But the results are clearly lacking. The PSC’s recent actions regarding Central Hudson’s rate proposal clearly strengthens the argument that consumer concerns are being pushed around in what should be fair, reasonable negotiations. Energy is not a luxury;it’s a basic necessity. And many residents, particularly the elderly on fixed incomes or those who have lost their job or who are now working for less pay in this post-recession economy, are having a hard time paying their bills. Cahill has pointed out thestate once had several groups that were on solid ground fighting on behalf of residential and low-income ratepayers but “those important groups have been dissolved and de-funded leaving the average citizen without a voice during thisprocess.” While public sentiment was resoundingly against the increase, the PSC-approved delivery rate hikes are well above the general rates of inflation seen in Consumer Price Index reports, the Journal has reported. The plan does include some potential benefits, including providing incentives to reduce home-service shutoffs when customers fall behind in their payments and for the utility to participate in demonstration projects aimed at increasing alternative-energy use. Citizens for Local Power also made a compelling argument that the basic, fixed monthly charge should not be raised. Customers can’t do anything, such as use less energy, to avoid those costs. This fee, now $24 a month for residential, will stay the same instead of going up by $5 as had been proposed. The local community organization Nobody Leaves Mid-Hudson also did fine work in pushing to help those struggling to pay their bills. But, overall, the approval process perpetuates an unlevel playing field – one that puts the public at a dangerous and vulnerable disadvantage. A fair fight is needed.